Today is Thursday, which for me has become ‘Hashi Mashi Day'. That is how I remember the count, of how far I have come since I began way back on Thursday June 21, 2012. I was wondering why counting has helped me and I am going to write about that in a different post. But in the meantime, I wanted to share my new high in squats which I did today, on my 203rd day. I originally started with the bar only which is 45lbs. I had alot of reservations about doing squats at all. Mainly because ten years ago, I tore my left knee medial meniscus doing squats! So, to say that I felt very vulnerable even trying to do them would be an understatement. Then why did I even try to do them? I have read many times that squats are one of the best all around exercise that a person can do for building total body strength, not just leg strength. And, I have also read that squats, because they affect the largest muscles in the body, the quadriceps, the hamstrings and the glutes, that they are very powerful in terms of a residual effect on producing growth hormone and elevating testosterone levels. In brief, my testosterone levels had been about 240 for several years which according to what I have read, put me in a danger zone, under 300 testosterone is not where a guy wants to be, ever. After seven months of doing squats, between once and twice a week, my testosterone levels are close to 500 which caused my own doctor to raise his eyebrows and ask me if I had been using creams, patches, gels or shots of testosterone to raise the level that dramatically. My belief is that it has been the squats, the deadlifts, bench presses and pushups which are probably the main source of my improvement in testosterone. So, raising testosterone was one reason why I was willing to try out the squats again, despite never having repaired the tear in my meniscus. The other as I mentioned was the comments by many that squats are the best exercise to do for total body conditioning when it comes to free weights. 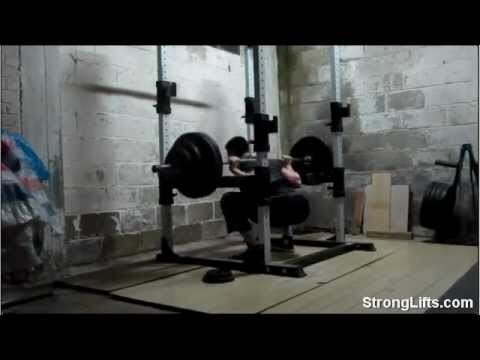 At about that time, when I was searching for more information on squats, I came across a reference from marksdailyapple.com which was pointing to Mehdi's stronglifts.com. And it was in Mehdi's stronglifts.com that I first read anyone saying that doing squats does not have to rip your knees apart, or even be hard on the knees. He maintained that if you squat below parallel, where your glutes will go lower than your knees, then the main exertion and forces are focused on your glutes and hamstrings, and not your knees. He said that when you only do half squats, where you do not go down lower than parallel, that is when all of the force is exerted on your knees which is when the problems begin, because the knee joint by itself has nowhere the power that the glutes and hamstrings do. So, with that new information, I began to test it out. I remember that the first time I did squats with the bar only, I was so sore in my glutes and hamstrings the next few days that I could barely walk! But at least I felt no pain in my knees at all! That was really exciting for me. That is where I began, with a 45lb bar, and I did 5 sets of 5 repetitions, which is the recommendation of Mehdi. He said that he got the idea from Reg Park who was a famous bodybuilder back in the last century. In the past, all of the times that I tried weightlifting, I would usually do 5 sets that started with 12 reps, then 10, 8, 6 and the last with 4. I cannot tell you why the 5×5 routine has been working so well for me physiologically, but it has been working great. Every week, I would add sometimes as little as 5lbs total to the bar, 2.5 lbs on each side of the bar. Who would think that would be effective? 5 sets of 5 repetitions, and only adding minimal weight, sometimes I added no weight if I felt that I still needed to get stronger. But it is effective, over the course of time, if you are consistent, it works! I have been consistently doing squats for over six months now, usually once a week, sometimes twice, but most of the time, only once. Perhaps I will build up to more frequently, max 3x a week, but in the meantime, this has been working for me. Today was my high in squats so far. From 45lbs with major soreness when I began to today, I did 5 reps of 110lbs with no soreness, and I believe that my knees are actually stronger than when I began in the first place. I did not do 5 sets with 110lbs, but started with warmup sets, first 75lb, then 85lb, 95lbs, 105lbs and the last set was with 110lbs. Stand with your feet about should width apart, feet facing straight ahead. Begin the squat by pushing your glutes back first, I think that is the most important of the technique, to lead with your glutes, because you dont want to be putting unnecessary pressure on your knees. The last reason that I squat, which I was not aware of until I started to do them, is somewhat metaphorical. It might sound trite, but being able to lift the weight on my shoulders, started to give me more confidence that I could handle the emotional weights that I felt laden with at various times. As silly as it might sound, I would say that squats and deadlifts, the two major compound movements that I have been doing for the last six months, they gave me more confidence, general confidence that I can deal with the issues and that I was getting stronger, not only physically, but also mentally. And I would say that having more confidence, feeling better about myself, has certainly made everything that I have done the last 6 months worthwhile. Here is a great instructional video by Mehdi which is available on youtube. He explains how to squat and you can see what it means to go below parallel. He also has a free guide to his 5×5 program which is really informative and motivational. Enjoy! By the way, the picture on this post is a pretty good example of body position when doing a squat, all shown by a baby, so seems that squats are pretty natural to do. They are not easy, but definitely worth it. Have you done squats, are you interested? What are your favorite exercises, how are they helping to transform your body, mind and spirit? Please share so we can all benefit, Thanks!